Is something moving over there? A rhino perhaps, or maybe even a tiger?! We are all silently waiting at one of the hotspots, only whispering and hidden by the bushes around us. It’s a huge contrast to the busy and very noisy time we have spent in India. 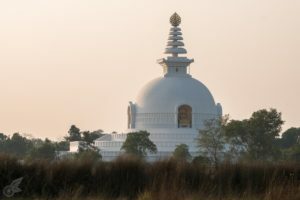 We had left Delhi and cycled in a straight line to the Nepalese border, craving a more relaxed atmosphere, nature and the chance to camp once again. Nepal didn’t disappoint – we followed Highway 1 eastwards through lush subtropical forests, crossing blue rivers with fresh water and shared the small road with more cyclists than cars and bigger vehicles. We decided to stop at the Bardia National Park, a wildlife reserve with tigers, rhinos, elephants and crocodiles. The park offers various activities and we opted for a jungle trek. Our guide led us through the high grass and dense forests to different spots where there might be a chance to spot some of the exotic animals. We found many footprints but we only sighted monkeys and lots of red deer. 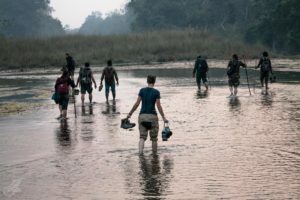 When we left Bardia we weren’t able to cycle far enough and were forced to camp in a forest that probably still was part of the wildlife reserve. I have to admit that I was also waiting for a tiger to show up then but this time I was relieved that we didn’t see any exotic animals. 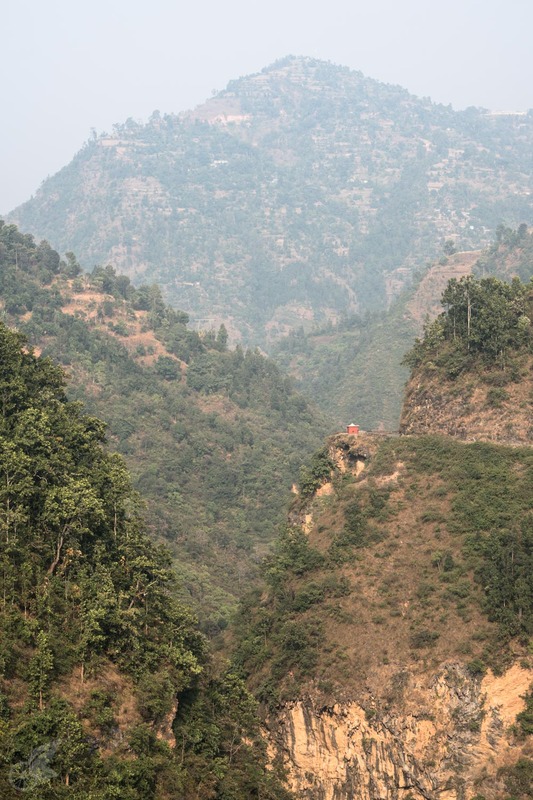 Another big difference between our cycling experiences in India and Nepal was the elevation. 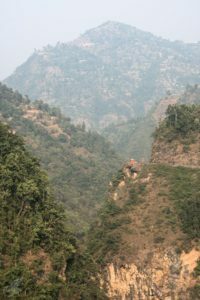 While the route in India was completely flat we were now approaching the Himalayas and the road we followed led us through the foothills following different river valleys. The hills were either covered in dense jungle or dotted with rice terraces. The road to Pokhara is wiggling its way through those hills and our days were filled with slowly crawling up steep passages and then racing downhill with big smiles on our faces. Aside from the challenge to cycle in these hills it is also a challenge to camp there. Our solution was to ask people if we could camp in their fields and they always said yes. Once two boys showed up and shyly invited us into their home because they pitied us. The Nepalese winter feels like more like autumn to us but nevertheless the nights are cold and the poorer people don’t have warm clothes. Most of them are walking around in slippers and some are even barefoot. 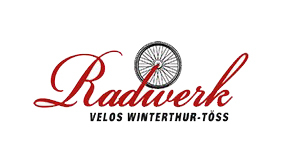 Although some of the cycling days have been tough the food more than made up for it. We are still cooking in the morning (now using beaten rice flakes instead of oats) and evening but stop at restaurants for lunch. Our favourites are Fried Noodles and Momos (filled dumplings) but since we are burning so many calories we usually order two portions per person which seems to confuse many people. In general we are big fans of the food here and enjoy tasting lots of different street food. Since Nepal is much more of a tourist destination compared to many countries we cycled through during the last months we are now able to find certain luxuries once again. Like cake and good WiFi. But mostly we care about the cakes. The Nepali people are predominantly Hindu and like in India we saw many shrines along the roads and in the villages. Buddhism however plays a big role as well and we visited the birthplace of Buddha in Lumbini in the South of Nepal. As we came closer to the mountains we started seeing some Buddhist prayer flags. Soon we will leave our bicycles for a while and attempt to trek the Annapurna Circuit. There we will see many signs of the Tibetan culture and Buddhism and the diversity of the whole region. You write very well. Keep up the great job. Thank you very much, We will try to keep up.